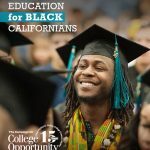 Los Angeles, CA – Today, The Campaign for College Opportunity released “The State of Higher Education for Black Californians,” a landmark report that reveals progress the state is making in better preparing Black students for college even while major inequities in college access and completion persist at our community colleges and universities. California is home to 2.2 million Black residents and has long benefited from significant contributions by Black Californians who have made the state more equitable, prosperous, and entrepreneurial. However, growing racial equity gaps in education mean that too many talented Black students do not earn the degrees and credentials they need to be upwardly mobile and that the state needs for its economy. The good news is that a record number of Black 19-year-olds – nearly 90 percent – have a high school diploma, more Black students are prepared for college, and many more are enrolling in college than in years past. There are currently over 204,000 Black undergraduate students in California, the majority (84 percent) of whom are enrolled in California’s public colleges or universities. Two-thirds of Black adults have gone to college and for Black students who attend the University of California (UC), 75% will graduate in six years…Read more. The new Governor proposes a historic $1.4 billion increase over last year’s budget with key investments in college access, success, and affordability. In his first budget proposal, Governor Gavin Newsom demonstrates that he clearly understands the value of a college education in helping to break the cycle of poverty, providing life-long opportunity, and creating a strong economy. Budget investments for thousands of new seats for California students, proven practices that improve graduation rates, and college affordability are the first steps toward the bold new vision and action California needs in higher education. Understanding that free community college is just one tool to address the affordability challenges facing today’s students, Governor Newsom rightly proposes over $150 million to address hunger, housing, and the needs of student parents at our community colleges and public universities. We applaud the governor for giving a clear directive to our college and university leaders to continue to improve transfer, time to degree, student success, and to close college success gaps. The governor has kept his campaign promise to establish a strong educational data system from pre-K to K-12 to college and the workforce. Now is the time for the governor to exercise his leadership in establishing a statewide higher education coordinating body that is inclusive of the civil rights and business communities, that can set an ambitious North Star goal for statewide college attainment, that regularly monitors progress, and holds our colleges and universities accountable for delivering on the foundation the governor is laying in his budget proposal. “The governor is proposing significant investments in expanding college access, improving college affordability, supporting undocumented students, and requiring our college campuses to improve transfer, time to degree, and close gaps for underserved students – that is a win for our students and our economy,” said Michele Siqueiros, president of the Campaign for College Opportunity…read more. Several California Community Colleges and California State Universities to be honored for their success at enrolling and graduating Associate Degree for Transfer earners. Today, the Campaign for College Opportunity announced that they will honor twelve California Community Colleges and four California State University (CSU) campuses for significantly increasing the number of students earning an Associate Degree for Transfer (ADT), enrolling those students at a CSU with junior status and graduating ADT earners with a bachelor’s degree. Transfer from the community college to a four-year university is described as bureaucratic, inconsistent, and confusing, where students must parse through a system with varied information and requirements for each campus, according to research and student testimonies. Though transfer is often thought of as a two-year process, only 4 percent of California Community College students transfer after two years, 25 percent after four years and 38 percent after six years. In 2010, with then-Senator Alex Padilla, the Campaign for College Opportunity sponsored historic transfer reform legislation that created a clear pathway for students to earn an associate degree and guaranteed admission as juniors to the CSU system. The ADT insured that students would transfer without spending excess units, time, and, in turn, money. To date, more than 100,000 students have earned an ADT, and of those that enrolled in the CSU, they earned their bachelor’s degree almost twice as fast as other transfer students. 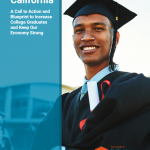 Los Angeles, CA – A broad-based coalition led by The Campaign for College Opportunity launched the “Our California” campaign elevating the critical role that California’s higher education system will play in shaping the state’s economic future and calling on the next governor to develop a plan for improving college access and success. Over the next 12 years, California will need 60 percent of adults to have some college credential in order to meet growing workforce demands for college educated workers, a feat that can only be accomplished if California’s next governor commits to a statewide college attainment goal and creates the necessary plan and investments to meet that goal. The Campaign for College Opportunity, and its coalition partners, underscore the need to adopt a 60 percent college attainment goal and to close persistent racial equity gaps in college opportunity by 2030. 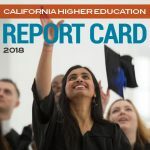 The new 2018 California Higher Education Report Card was released as part of the “Our California” campaign, which provides a snapshot of the progress the state is making towards reaching 60 percent attainment by 2030 and closing racial equity gaps. The report card measures the state’s progress across four critical indicators – college preparation, access, completion, and affordability – that impact the state’s ability to meet the attainment goal. California receives a B+ when it comes to fully preparing high school students for college. This takes into account high school graduation rates and completion rates of the A-G curriculum with a C or better. California receives a C on college completion, which measures the rate at which students who enroll in college successfully complete a program of study. California receives a C in its ability to keep college affordable for California families. This measures takes into account the real cost burden that low-income and middle-income must take on to send their children to California’s public colleges and universities. Over thirty prominent social justice, civil rights, business, and student organizations joined the Campaign for College Opportunity to press the California Community College Chancellor’s Office, the Governor and Legislature to ensure any new funding formula addresses the needs of vulnerable populations, recognized important milestones in a students’ progression toward a degree, and provides additional incentives for colleges to promote the success of low-income students. 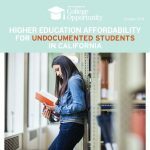 Governor Brown’s ambitious proposal to revise the California Community College funding formula has been strengthened significantly in his May Revise and now includes key considerations for the enrollment of low-income and undocumented students, progression milestones, and additional dollars toward the success of low-income students. Research, technical assistance, philanthropy, advocacy, and business organizations collaborate to launch the Promises That Count initiative aimed at strengthening local College Promise programs and increasing the number of students who earn a college degree or who transfer. (Los Angeles, April 3, 2018) — The California College Promise Project (CCPP) at WestEd is partnering with Campaign for College Opportunity and UNITE-LA to launch the Los Angeles County Promises That Count initiative. Funded by the California Community Foundation, the three-year initiative focuses on supporting the development, implementation, and continuous improvement of College Promise efforts, with the goal of ensuring stronger institutional support so more students graduate in Los Angeles County. College Promise programs incentivize college enrollment, persistence, and completion by providing financial, academic, and other support services to students based on where they live or where they attend school. While the financial support from Promise programs is critically important for many students, it is not enough to ensure that they will be able to attain their higher education goals once they enroll in college. Too many California college students do not complete a degree or, in the case of community college students, do not earn a credential or transfer to a four-year institution. Their higher education efforts can be derailed because of an outdated remedial education system, insufficient academic support, or a confusing transfer maze. Despite a racially and gender diverse student body at California’s public colleges and universities, centers of power remain White, threatening California’s ability to produce more college graduates and remain economically competitive. (Los Angeles, CA) — Today, on the 50th anniversary of the East Los Angeles Walkouts, the Campaign for College Opportunity released a new report “Left Out: How Exclusion in California’s Colleges and Universities Hurts Our Values, Our Students, and Our Economy” that shows the drastic disparity between California’s public college and university students and higher education leaders and faculty when it comes to race and gender. Fifty years ago in East Los Angeles, Latinx students led the protests over unequal conditions and practices in their high schools as part of a movement to improve the quality of their education and ensure they were prepared for college. 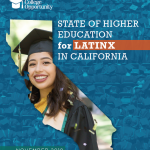 Today Latinx make up 43% of undergraduate students in California and 69% of all undergraduate students are racially diverse. Despite this diversity, over 60% of college faculty and senior leadership on California’s campuses and 74% of Academic Senators are White. And, although 54% of college students are female, women are underrepresented among tenured faculty, academic senators, college leadership and in statewide governance. California’s standing as the sixth largest economy in the world depends on producing more college graduates but persistent gaps in college access and success for African-American, Latinx, Asian American, Native Hawaiian, and Pacific Islander (AANHPI) students hinder progress. Racially and gender diverse college leaders and faculty are key to improving success for all students. “The findings of this report are not about demographics, they are about helping our education leaders and state policy makers understand that this issue of a lack of diversity is tied to student success,” said Paul Granillo, President and CEO of the Inland Empire Economic Partnership. Within the University of California (UC) system, where 26% of the student body are Latinx, there are ZERO Latinx leaders in the UC Office of the President. Additionally, only 11% of college leaders, 7% of tenured faculty, and 5% of Academic Senators are Latinx… read more.